So, for Blog Wars X, I had decided to take an all Ravenwing army to the tournament. With Blog Wars being a friendlier type of tournament with no extreme lists (though that doesn't mean the games are not tough! ), I thought I would take a more thematic list down to Stockport. 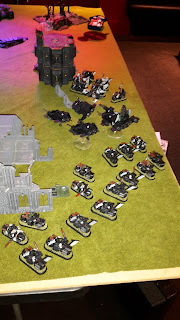 With the new codex and the awesomeness that is Ravenwing, I put together a proposed list and went about playtesting the army to see how it would perform (for my efforts on this, check out my Battle Reports). Not too many changes from my original list, only one significant one; swapping the Librarian for the Interrogator-Chaplain. With my White Scars command squad and Librarian being finished last week in preparation for Rapid Fire 2015, it was time to turn my attention to my Dark Angel's flyer. 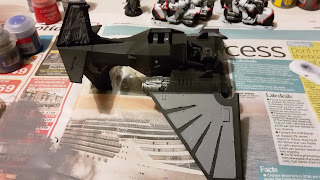 With Blog Wars X fast approaching at the end of the month, it was time for me to get cracking with painting my Dark Talon. I had previously magnetised the flyer in order to be able to field both variants. Having never magnetised anything before, I was quite pleased with how it turned out in the end, but now it was time to get painting. What I love about Ravenwing is that once the undercoat is done, a lot of your work in painting the model is essentially finished as the major colour in the army is black. I started off by giving the metal areas a drybrush with Boltgun Metal to pick out the details. Next, the areas to be painted white (the wings, Ravenwing symbols and Dark Talon iconography) were given a coat of Dawnstone grey. 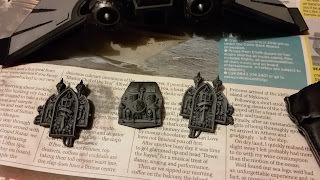 In the case of the iconography, this was drybrushed over the black undercoat. As the title says, at some point yesterday while I was at Rapid Fire, the blog hit 40,000 views. 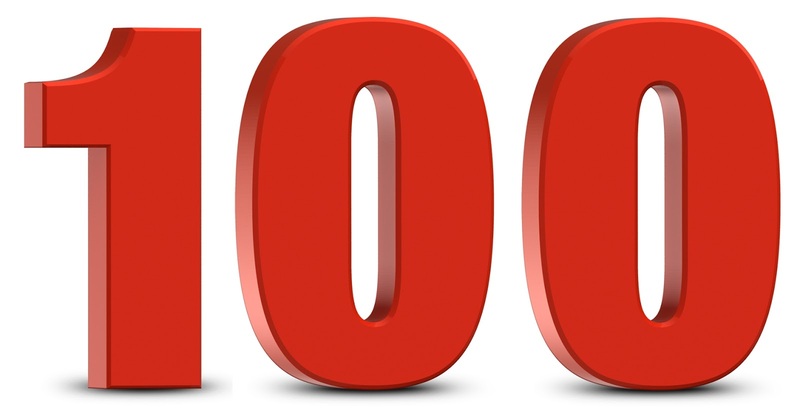 Given the main subject of this blog, I thought it was appropriate to highlight this milestone. 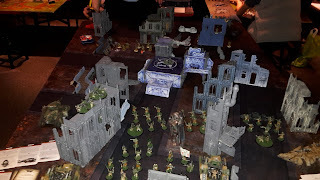 This week's battle report was my first set game in the Medusa IV map-based campaign that I am running. Shaun's Tau decided to use their newly captured spaceport to launch an assault on my own spaceport in the centre of the map. Having faced Shaun last time, I knew this was going to be a tough game for my Guard. I started with the ever useful company command squad. I love the orders that this unit can give, which would hopefully help me take down any Riptides or vehicles the enemy may have when used correctly. I took the Officer of the Fleet as I knew I would be taking a Vendetta and wanted to ensure its quick arrival. When I rolled my warlord trait, it worked out even better as I could now use 3 outflanking units, so hopefully he would help with these too. NOTE: When writing up, I discovered that I had included an extra platoon command in my army when I deployed it that was not on my list, so I had 3 instead of 2. I never noticed this error until later, apologies to Shaun for the mistake. I backed them up with two psykers and a priest. Tau have little in the way of psychic protection, so I thought I should be able to get the powers off relatively easy. They were mostly for casting prescience to get re-rolls to hit, but I might have got lucky with the other powers. Not so much when I rolled. I was hoping to get Forewarning or Misfortune, but I never seem to roll these. I ended up with some pretty useless ones; Overwatch at full BS against Tau! Great! I'm sure that will come in handy. Ignores cover may be useful, but I am more likely to get this from orders and Precognition is pretty useless on a Guard Psyker. 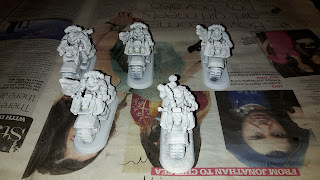 I took two platoons, each armed with heavy weapons to deal with the Fire Warriors or anything larger. The veterans were chosen as a Riptide hunting unit, they could hopefully cause some damage with their meltaguns and meltabombs. I took two Wyverns to deal with any troops in the enemy army and the massed firepower of the Punisher is always useful. I finished the list with a Vendetta, hoping that the three lascannons could deal with most of the big threats. 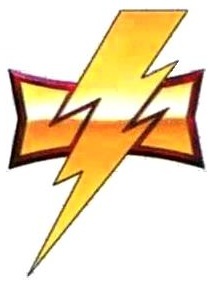 This weekend, I will be attending Rapid Fire 2015- a local tournament run by Stirling Wargamers. This is a two day event, featuring six games of 40k against what I imagine will be some very tough competition. For the tournament I have decided to take my White Scars as I feel they have a lot of mobility necessary for objective grabbing and can bring a fair amount of firepower to the table with access to grav weapons and other goodies. The list will be based on my Blog Wars 9 list, but with some modifications with the release of the new Space Marine codex since then and some new purchases. Lets take a look at the list in a bit more detail. Hi everyone, another quick post here today. 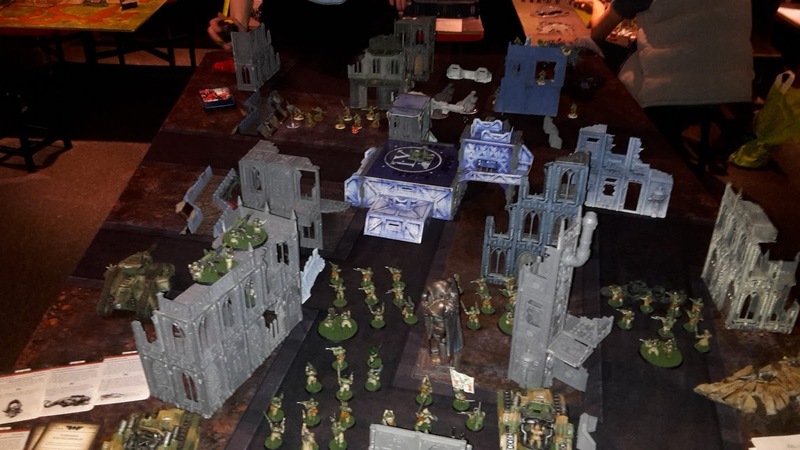 I wanted to take the opportunity to highlight a couple of blogs from some people at the Dundee Wargames Club that I attend. Two of my fellow players have recently started their own blogs and I just wanted to let you good people know. First up we have Project K from Kev. 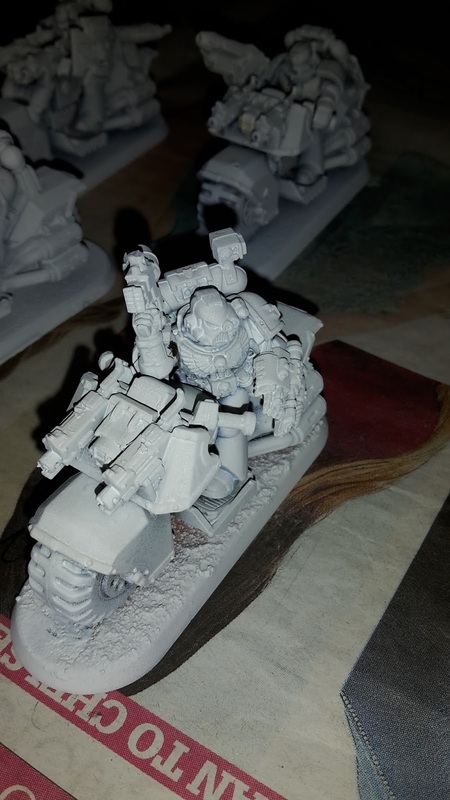 In his own words, this will be "a blog detailing model projects with full explanation and technique". Kev plans to write highly detailed tutorials on all his projects that will include both 28 mm and larger scales, as well as models from a range of kits, not just wargames. So far, he has been posting about his first project (quite an unusual resin sci-fi kit) and gives detailed instructions on what materials to use and how to accomplish easy tasks such as filling and sanding. 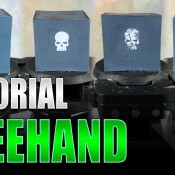 Great for beginners or for anyone wanting to pick up a few additional tips. 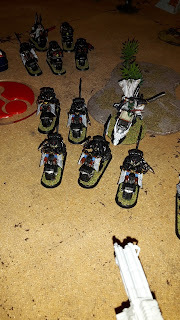 A few of the gamers from the Dundee club have started their own blog, detailing their adventures into Bushido, a Samurai based skirmish game. 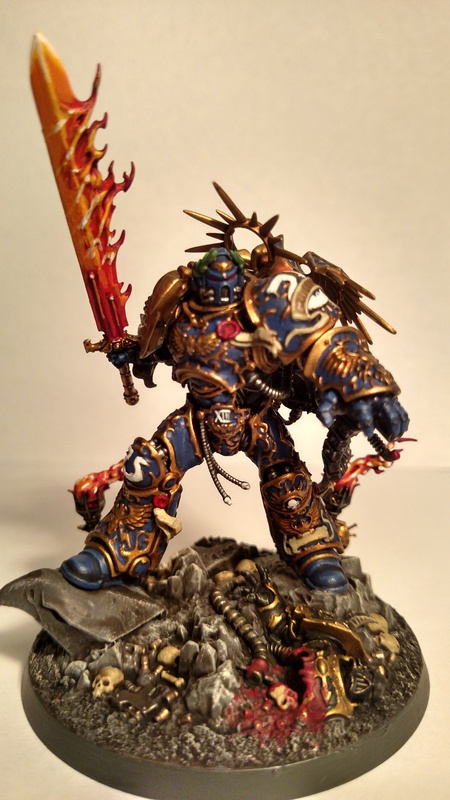 They plan to show off their miniatures, battle reports and a bunch of other cool stuff. I also believe they are planning to do some introduction articles on the game for those that know nothing about it (that includes me!). Having never played it before, I am keen to find out about the game and look forward to reading their thoughts on the mechanics and different factions that are in it. So there you have it, please check them out; read, like, comment and have fun! 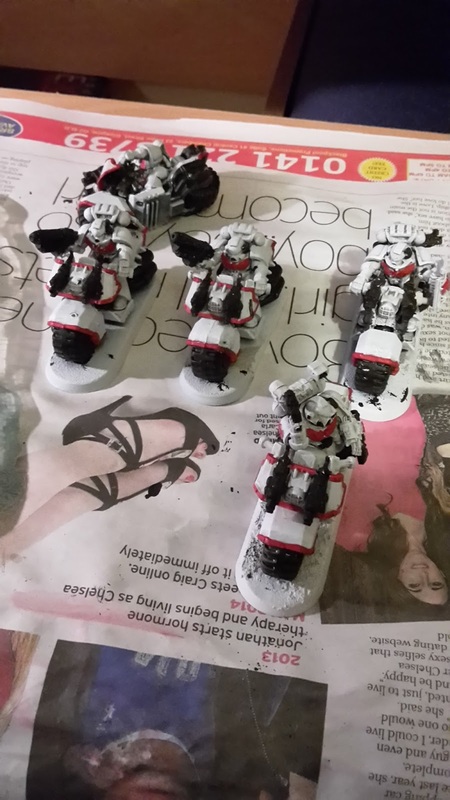 Hobby Sunday 18/10/15- White Scars command squad and Librarian. This week I have been focusing on finishing my White Scars command squad. I wanted to get these finished for an upcoming tournament taking place in Stirling. 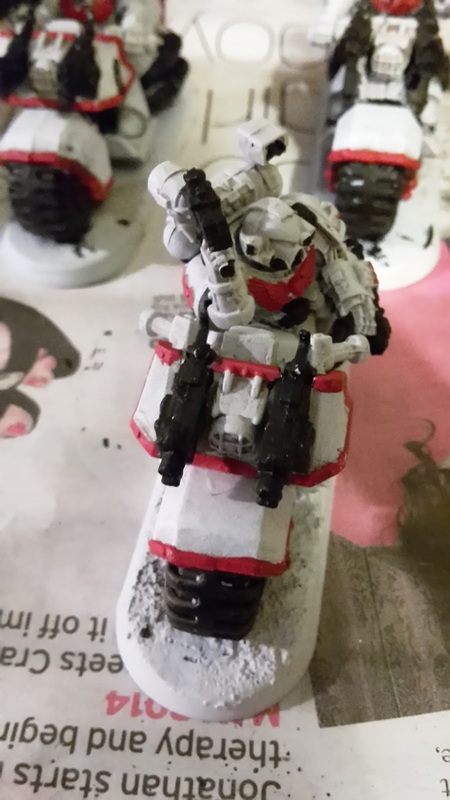 I painted up my bikers using my standard white scars colour scheme. They turned out to a decent tabletop standard, but I haven't gone over the top on the details. I could maybe come back to them at a later date. I still need to add flock and transfers to the squad. Hi everyone, just wanted to celebrate an arbitrary milestone for the blog. 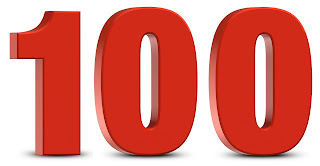 This is my one hundredth post! Having started on this blog 7 months ago, I am happy to have got this far and hope to continue with many more posts to come. As well as continuing with regular battle reports, I have two upcoming tournament that I hope to write about and I still have to showcase my Ork and Vampire Counts armies at some point (I just need to get around to taking them all out and photographing them). Of course, this wouldn't mean anything if it wasn't for everyone who makes this such an enjoyable experience to do. 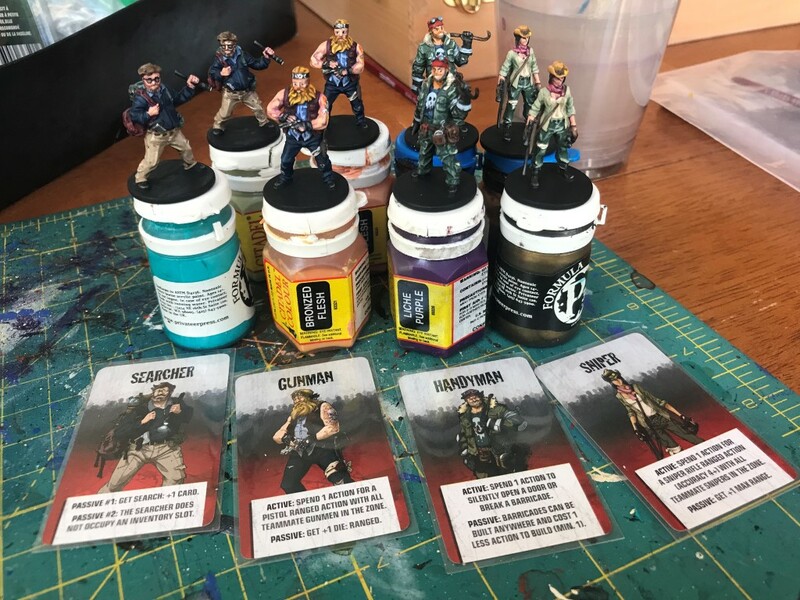 Thanks to everyone who reads my ramblings each week on the blog, all those who take the time to post comments on my articles and thanks to everyone who lets me write up our battle reports and share them online. If you want to keep up to date with the next 100 posts, you can use the followers box on the top right of the page to subscribe and get updates every time I write a new post. No battle report this week, so instead I thought I would do something a big random and nothing to do with 40k! (Don't worry, normal service will return shortly). I have never been a big fan of cooking, I don't enjoy coming home from a long day of work and going to the kitchen to make a meal. I much prefer throwing something in the oven and crashing in front of the TV. When it comes to baking however, that is a totally different matter. 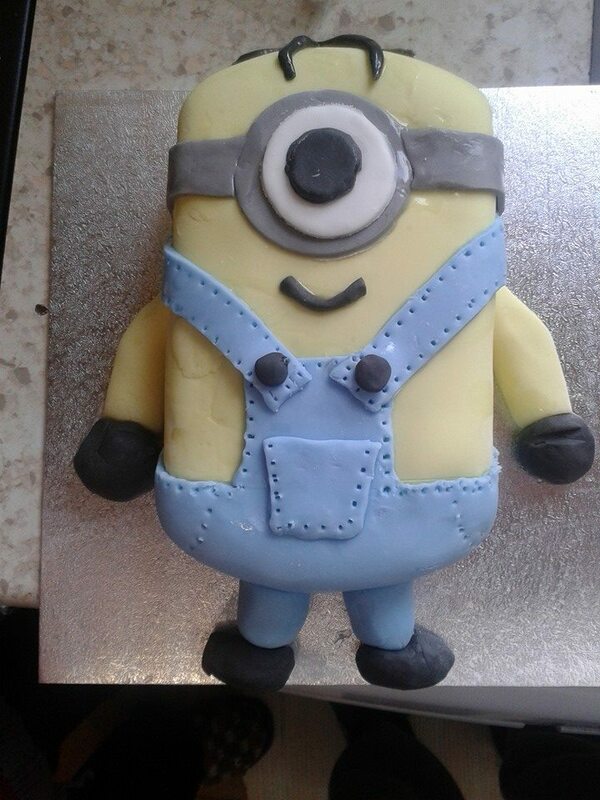 I have only become obsessed with baking over the past few years and it has come as a shock to a lot of my friends and family. 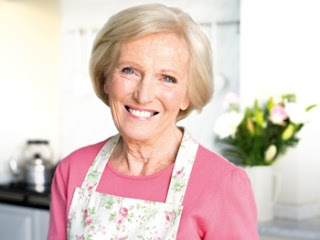 I (as have many others) have been partially inspired by the Great British Bake Off- possibly the greatest show on TV. For those of you that don't know, this is a BBC show where each week, a team of 12 bakers are set three different baking challenges and the worst is removed from the show each week until the last three remain to compete in the final. It's a lot better than that brief description makes it sound (for my American readers out there, you had your chance to have this show on your side of the pond, but apparently it bombed. Your loss I say!). The rest of the forces have attacked a little closer to home, hoping to grab the more easily captured territories. 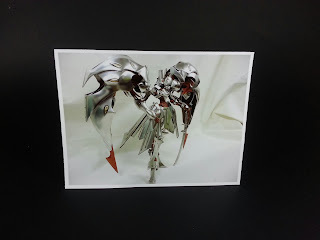 The exception is the Saim-Hann Eldar, who have used their superior speed and skills to strike out and halt the Ork threat before it advances too far. 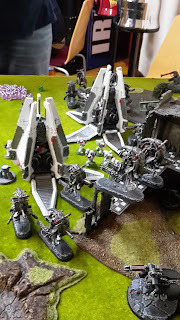 Meanwhile, the traitorous Chaos faction had launched an assault on the Eldar lines while their attention is elsewhere, hoping to regain their lost ground. "I felt a great disturbance in the Warp, as if thousand of narrative gamers suddenly cried out in terror, and were suddenly silenced. I fear something terrible has happened." 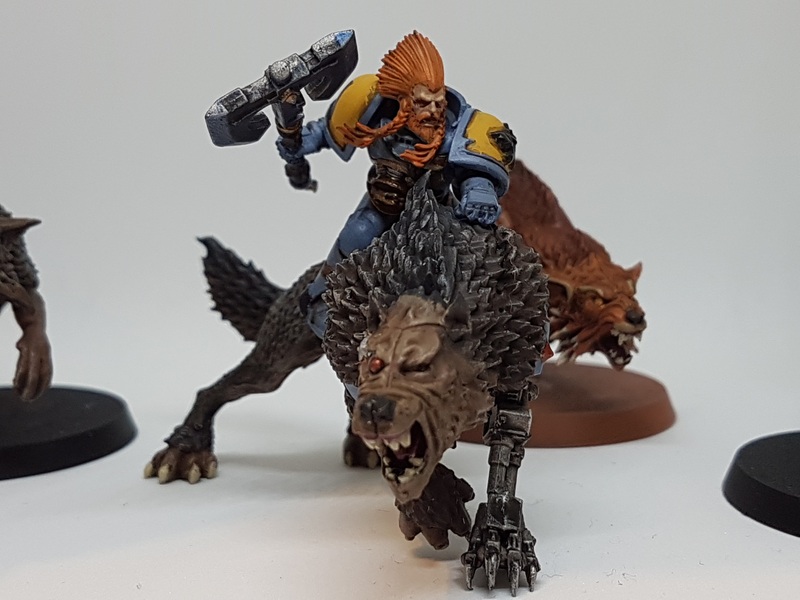 Just a quick hobby recap this week, as I haven't been able to get much done. 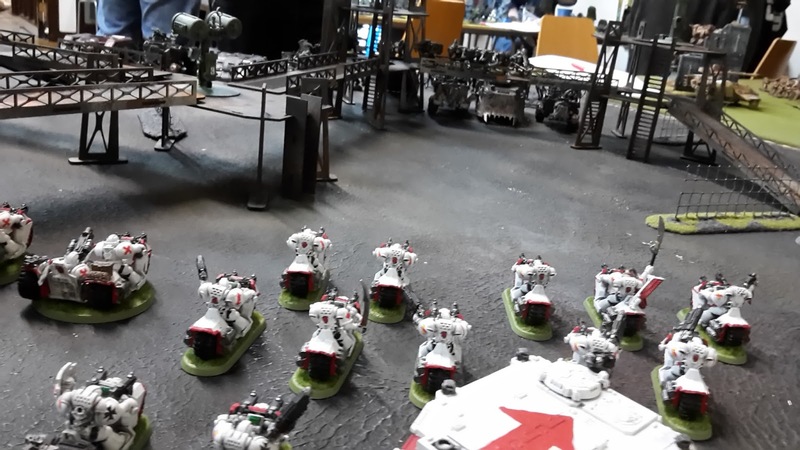 I decided to add a command squad to my White Scars army for an upcoming tournament at the end of October. I decided to make the standard super-hard command squad that tournament players love and makes narrative players turn away in disgust. 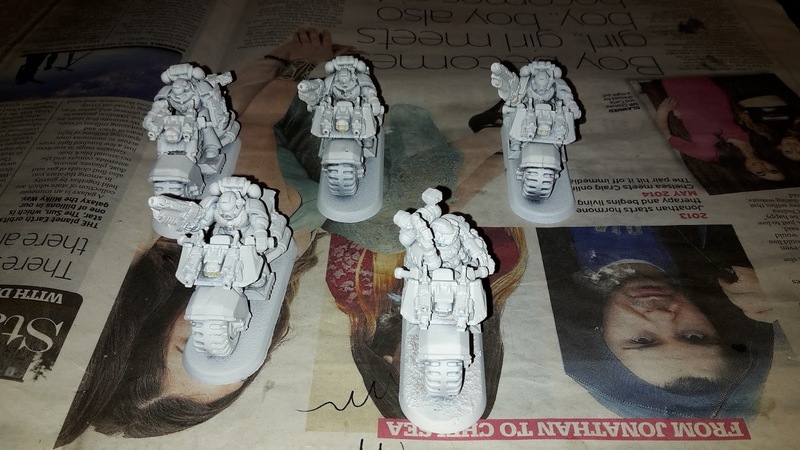 I purchased some space marine bikers and grav gun equivalents from ebay and managed to scrounge up some storm shields from Dundee Wargames club (thanks to Andrew for providing me with his spare shields!). I already had the Apothecary parts, so assembled and undercoated my command squad. This week's battle report is another campaign game, with my Ravenwing taking on the might of the Tau Empire (ably commanded by Shaun). 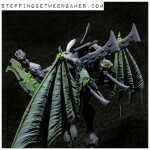 As many of the regular readers will know, I am planning to take a Ravenwing army to the upcoming Blog Wars tournament. I have previously discussed what I think are the strengths and weaknesses of the army. I think that one of the toughest armies to face will be Tau. They have access to a range of high strength weaponry that will render my biker's increased toughness useless as well as having a lot of access to ignores cover for the whole army through markerlights. I wanted to see how my army would fare against a Tau force and challenged Shaun to a game. I decided to give the Librarian another go. 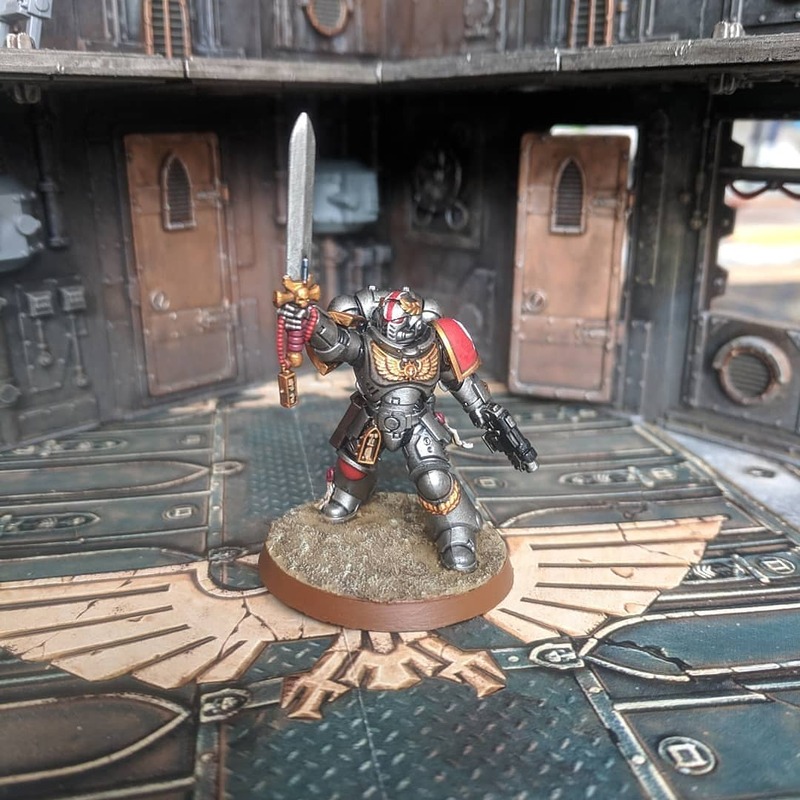 I am torn about this as I can see the appeal of the Interromancy psychic powers, but just have not had much success with them in battle, whereas the Interrogator-Chaplain provides a reliable bonus to the Black Knights with his Zealot re-rolls. I rolled up my psychic powers and got Mind Worm, Aversion and Seeds of Fear. This was a really nice set of powers to get, Aversion would come in very handy, forcing a unit to snap fire each turn would hopefully make a serious dent on the Tau firepower coming my way. 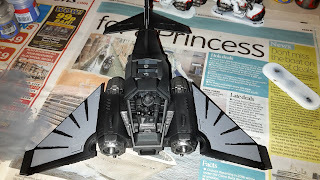 This week I finally got started on magnetising my Dark Talon/Nephilim Jetfighter that I purchased back in August. Having never used the flyers before, I wanted the option of being able to use both variants for a bit of variety. I think I perhaps started with a pretty complex kit as my first attempt, but my mind was made up and I wanted to give it a go. I purchased a Dremel hobby drill and some 2x1 mm magnets and started to get to work. Once I started, I then realised how fiddly the magnets were. I was having a real problem getting them in to position properly and kept dropping them all the time. I decided I would need to purchase some plastic tweezers if I was going to have any chance of getting it done. My first problem was finding any. I scoured the local craft and hobby stores, but had no luck in finding any. I then purchased a set of plastic tweezers online, but forgot to check the delivery date. After a few days with no tweezers, I checked my order and discovered that the delivery time was anywhere from mid-September to the end of October. Fortunately, they arrived in just a few weeks, hence why it has taken me so long to get started on it. 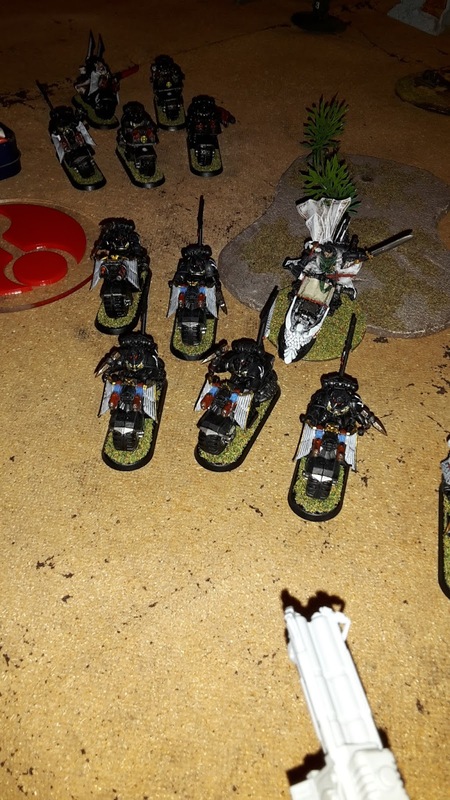 In this week's battle report, my Ravenwing army takes on a force of Chaos Space Marines, commanded by Thomas, as part of the Medusa IV campaign that I am running. I have swapped out the Librarian from my original army with an Interrogator-Chaplain. I feel this gives the Black Knights a bit more punch in combat with the Zealot re-rolls and I never had much success using the Librarian.